It is sad that many fall and winter vegetables get a bad rap. Broccoli, Brussels sprouts, beets, celery root and parsnips often get passed over for prettier, flashier produce. The next time you’re at the farmers market or grocery don’t breeze past these seasonal standbys! Here’s why. Winter is also described as the dreaded “cold and flu season.” But, we forget that nature knows exactly how to take care of us to help prevent sniffles, sneezes and sore throats. Many of the veggies available this time of year are packed with the vitamins and minerals you need to support your immune system and fight off winter illness. Think oranges are your best and only source of flu fighting vitamin C? Not so! Many of our winter green vegetables like broccoli, Brussels sprouts, kale and spinach have more vitamin C than an orange in addition to lots of other amazing nutrients to balance blood sugar, boost energy and support healthy blood pressure. Other winter veggies like beets and parsnips are packed with vitamin A and other minerals that your immune system needs in order to put up it’s strongest defenses. For a recent cooking class I was challenged to use turnips. My client had a field of turnips and wanted some more inspiration to use her growing stockpile. I have to admit that I’d passed over these guys more often than not at the market but was excited to create a simple and delicious way to use them. Turnips are a very typical winter root vegetable. This time of year they are usually white with some red-purple color at the top where the greens grow. You can use them as a replacement for potatoes in a hearty stew or cook and blend them into a creamy soup with cauliflower. I think they are especially delicious raw! If you know me at all you know how much I love salad. But, this time of year eating a green leafy salad is just not appealing to me. When I came across making a turnip slaw I was excited about being able to put a salad-dish back on the dinner table that matched the season a bit more than green leaves. Turns out this salad keeps VERY well. You can store any leftovers in a jar and take them to work with lunch the next day. You might have to add a pinch of salt or splash of vinegar because the flavor can subside a bit when it sits. I used my spiralizer for to cut my turnips. This is one of my favorite kitchen gadgets EVER! What it does it quickly turn any firm vegetable or fruit into a fun spiral shape. You can spiralize zucchini into “pasta,” potatoes for roasting or carrots, beets, turnips, apples and more for salads and other food decor. Every time I’ve used the spiralizer at a cooking demo or class people go nuts over it and vow to buy one right away. If you use a large fruit or vegetable you will end up with a never-ending spiral. What I like to do is then cut the spirals a few time with a knife to make eating a little easier and less messy 🙂 If you don’t have a spiralizer you can shred your turnip on the larger holes of a box grater. Place the chopped onion in a small bowl and cover with warm water. Set aside. This will draw some of the spice from the onions so they become more mild. Whisk together the vinegar, olive oil and honey until smooth in your salad serving bowl. Set aside. Peel the turnip and carrot and grate or spiralize them into the serving bowl with the dressing. Toss until well combined and season with salt and pepper to taste. Enjoy! Beef stew screams fall. Just the THOUGHT of beef stew has me thinking cozy fires, comfy blankets and fuzzy slippers. I used to think making beef stew was something only my mom could make. Why? Because it seemed very complicated and labor intensive. Plus, I was afraid it would never taste as good as hers. That can be a big stumbling block! Even though my mom doesn’t live far away I recently realized that if I want beef stew, it’s up to me to make it. After a brief call to mom I dove in and made a very simple but amazingly delicious beef stew. That was about 6 weeks ago and Mr. Wes has requested beef stew two more times. I would offer him pizza and he would ask “do you have any more of that beef stew?” Yeah, it’s that good! As the title suggests, this is a very basic recipe. Don’t be afraid to add different veggies, herbs and seasonings. You could throw in turnips or even cubed butternut squash for a nice sweet/savory dish. I like to double the recipe and then freeze it in small jars for great single serving lunches and dinners. dried herbs of your choice. I like savory and thyme. In a large pot or Dutch oven heat a generous glug of olive oil over medium heat. Add the beef cubes and a pinch of salt. Brown the meat about 8-10 minutes until it becomes nice a caramelized and juices start releasing. Give it a stir every few minutes so it cooks pretty evenly. Place the partially cooked meat in a bowl along with the juices. Set aside. Put your pot back on the stove over medium heat and add about 2 tablespoons of olive oil. Add your chopped leeks and a pinch of salt. Cook the leeks, stirring occasionally, until they begin to soften a bit, about 4-5 minutes. Add the garlic, carrots and potatoes to the pot and continue cooking the vegetables another 5-6 minutes, giving them the occasional stir so they cook evenly. If they start getting stuck to the bottom of the pot add a splash of water. This will help prevent sticking and release delicious browned bits from the bottom of the pot. Once your veggies have cooked a bit and become slightly softened add your meat and juice back to the pot along with the water bay leaf, a generous pinch of salt and herbs of choice. You want your ingredients to be covered by about an inch of water. Cover the pot, raise the heat to medium high and bring the stew to a boil, then lower to a simmer. Cook the stew for about 30 minutes, checking occasionally and giving it a stir. Your veggies should be soft but not mushy and your meat cooked through. Before serving, taste the broth and add salt and pepper and needed. Enjoy! October is National Breast Cancer Awareness Month and this weeks fall soup recipe is packed with a food that can help us kick cancer in the kitchen. By cooking and eating whole, unprocessed foods you are taking a huge step towards preventing and recovering from cancer and many other diseases. True health really begins in your kitchen! The American Cancer Society’s key recommendation to reduce the risk of cancer is to eat cruciferous vegetables on a regular basis. Cruciferous vegetables include broccoli, Brussels sprouts, cauliflower and cabbage. This group of vegetables contains more phytochemicals (mostly in the form of glucocsinolates) with demonstrable anticancer properties than any other vegetable family. Popular studies have shown that the higher the intake of these vegetables the lower the rates of cancer, particularly colon, prostate, lung and breast cancer. Cabbage is “king” of the cruciferous vegetable family because of its extra-special health powers. The glucocsinolates in cabbage work primarily by increasing antioxidant mechanisms and improving the body’s ability to detoxify and eliminate harmful chemicals and hormones. That means keeping cancer out and inviting health in! If that wasn’t enough, cabbage also has more vitamin C than oranges. A weakened immune system doesn’t just open you up for the common cold but also creates a more hospitable environment for cancer. Fall is a great time to fill up on cabbage and all its amazing nutritional benefits. The market has beautiful tender cabbage that is sweet, crisp and perfect for a warming soup. Stop by the demonstration tent between 3-5 pm this afternoon to see how this delicious soup is made and get the first taste. You’ll never look at cabbage the same way again! Remove any ragged leaves from the cabbage. Halve the cabbage (so you have two quarters) and remove the core. Slice the cabbage into thin strips about as thick as a pencil. You can do this with a knife or on a mandolin. Cut the long strips in half once. Warm the coconut oil over medium heat in a large heavy bottomed pot or Dutch oven. Add the potatoes and a pinch of salt. Cook the potatoes, stirring occasionally for about 5-7 minutes until they start to become tender and brown a bit. They may stick a bit but don’t worry. The water will help get those stuck bits off the bottom. Stir in the curry paste (or powder), garlic and onion. Cook for another minute or so. Add the water and chickpeas. Raise the heat and bring the soup to a simmer. Add the cabbage and cook for another 3-4 minutes until it begins to soften. Don’t worry if it looks like there’s a lot of cabbage. It will collapse quite a bit. Taste your broth and add salt and pepper as needed. If you want a stronger flavor you can add more curry paste or a few shots of tamari. Enjoy! Serving Suggestion: This soup is delicious on it’s own but I really love it with a splash of coconut milk which gives it a very distinct Thai flavor. Or, you can add less water and put in a whole can of coconut milk – also delicious! You can also add a cup of cooked brown rice or millet to make it even heartier and filling. Beets – you either love them or hate them. If you already love them, welcome to the club! If you hate them chances are you’ve had the misfortune of encountering the canned kind on a restaurant salad. I agree. That version is less than stellar. I’m here to convert the haters into total beet-lovers so they can join the club and reap all the incredible benefits. Because, not only is this club delicious, it will do amazing things for your health! Here are just a few reasons to put beautiful beets back in your diet. 1. Love Your Liver: Your liver works 24/7 to keep to you clean and clear of toxins that enter your body. So, it’s important to give it a little love! Beets have long been used for medicinal purposes because of their ability to stimulate and liver’s detoxification processes. 2. 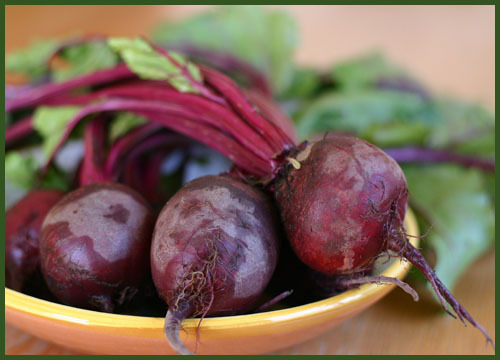 Beets for your Heartbeat: Beets are generally very supportive of the blood and circulation. Specifically, they contain important phytonutrients such as betanin and isobetanin and key nutrient choline that can inhibit inflammatory markers linked to heart disease. 3. Grab the Greens: The most nutritious beets are those with the greens still attached. Cut them off as soon as you get home or they will begin to wilt. The greens are highly nutritious and shouldn’t be discarded. They are rich in folic acid, especially important for healthy development of the fetus during pregnancy. They are also an excellent source of vitamin K for strong bones and vitamin A for good eyesight and healthy skin. You can sauté with garlic them, add them to soups or use the tender greens in a salad. 1. Grate the beets on the large grating insert of your food processor. (You can also use a box grater. If you grate them by hand rubber gloves can be very handy!) Scrape grated beets into a large bowl. 2. Peel the horseradish and grate it finely in the food processor or on a box grater. Add it to the beets and mix until well combined. 3. Add the olive oil, vinegar and herbs to the beets and horseradish. Combine well. Season with salt and pepper to taste. Enjoy! Serving Suggestions: This slaw can be eaten with crackers, on a sandwich, with grilled meat or alongside a hearty green salad. When in season grated carrots are a nice addition to this dish and replacing the horseradish with ginger gives it a refreshing bite. You can store this salad, covered in the fridge for up to 3 days.